THE UPND should not be allowed to cause chaos, anarchy and confusion in Parliament by senselessly disrupting debate in the House after boycotting its official opening by President Edgar Lungu on Friday, a University of Zambia (UNZA) lecturer Alex Ngoma has charged. 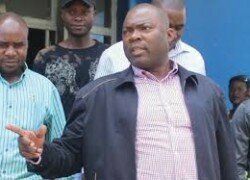 And Copperbelt minister Bowman Lusambo has charged that the decision by UPND Members of Parliament to boycott the official opening of Parliament was disgusting which should be condemned by all well-meaning Zambians. Dr Ngoma, who is a political analyst, said the UPND Members of Parliament (MPs) had gravely injured the doctrine of the separation of powers by failing to separate the defeat Hakainde Hichilema suffered at the hands of President Edgar Lungu in the last general elections from their responsibility to represent their electorate in Parliament. Dr Ngoma said it was a serious error of judgment on the part of the UPND MPs to have transferred their frustration of Mr Hichilema’s loss to Parliament where they were expected to represent the people who had elected them. He said the UPND must know that should they continue with their boycott, Parliament would continue with its normal business in the House and that it was the opposition party and their Constituencies who would suffer the consequences. “The decision by the UPND MPs to boycott the opening of Parliament on Friday is sad and very unfortunate because Parliament is a noble and sacred place where MPs discuss national issues affecting citizens. By boycotting the opening of Parliament, the UPND has forgone their responsibility to represent the people who elected them. That is a very serious error of judgment and a grave injury to the doctrine of the separation of powers. Zambians will therefore not allow the UPND to cause anarchy and confusion in Parliament by senselessly disrupting debates in the house,” Dr Ngoma said. And Mr Lusambo has warned Hakainde Hichilema and his vice-president for administration Geoffrey Bwalya Mwamba to start behaving like responsible leaders if Zambians were to trust them. He said the behavior by the UPND MPs only showed that they were up to no good but just to satisfy their selfish personal interest at the expense of Zambians many of whom had voted for them to be their representatives in Parliament. “Just last week the UPND MPs were sworn in and pledged that they will be loyal to President Lungu by defending and protect the Constitution of our country and for me that behaviour is disgusting. Let them continue staying away because with or without UPND the House will still debate and the country will move forward,’’ Mr Lusambo said. He said with or without the UPND MPs, business in the House would go on normally and the bills would still be passed and the MPs would eventually become irrelevant to the process and governing of the country.